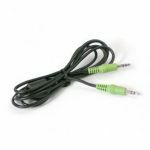 High-Performance Subwoofer Audio Cable with Precision-Formulated Polyethylene Dielectric Material and Solid-Core Bass Conductor for Maximum Bass Extension and Accuracy. 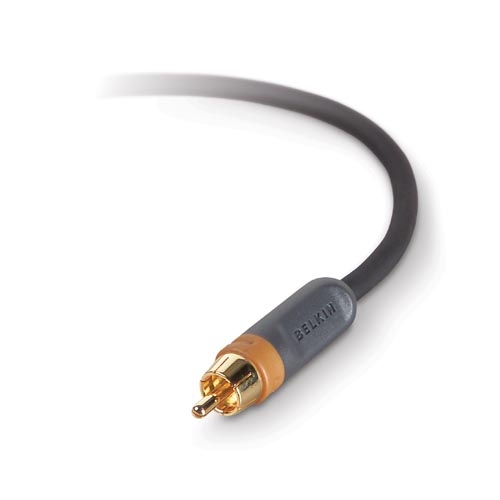 Experience an extended, more accurate bass with PureAV Subwoofer Audio Cables from Belkin. 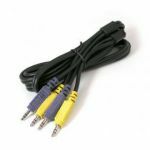 Designed to handle low frequencies produced by subwoofers, Subwoofer Audio Cables provide deeper and tighter bass than ordinary audio cables. Use of a solid-core conductor ensures the accuracy essential to delivering powerful bass, a vast improvement over a stranded-core conductor. -Delivers a fuller, more extended bass response using a balanced, solid-core bass conductor. -Improves audio clarity and provides a more natural-sounding midrange with superior-grade, 99.99%-purity copper conductors. 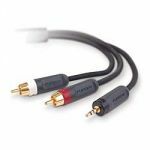 -Creates precise contact and increased durability with a split-tip centre pin and 6-cut, corrosion-resistant, 24k gold RCA connectors. -Provides maximum isolation from electromagnetic and radio frequency interference with double-shielded construction. -Isolates noise with 100%-coverage aluminum/Mylar foil shield. -Creates a second layer of protection with tinned, copper-braided shielding. -Eliminates the corrosion that is common in bare, copper-braided shielding.